Costa Rica’s abundant wildlife, rich biodiversity, and natural beauty, have made it a popular vacation destination, and the country has promoted socially and environmentally responsible tourism (ecotourism) to protect their natural resources. Unfortunately, despite these efforts, their growing popularity has created unintended, negative environmental impacts. For example, on my recent trip to Costa Rica I learned that in the Guanacaste peninsula, howler monkeys are not only threatened by habit loss from encroaching development, but also from another threat: electrocution. Unfortunately, as new power lines have been built to provide electricity for the new development, more monkey electrocutions have occurred as monkeys attempt to cross over uninsulated power lines. 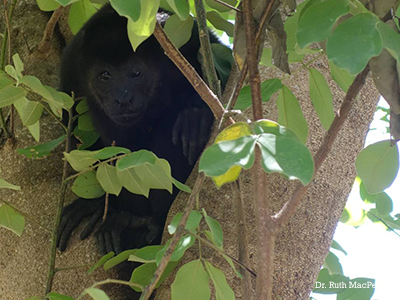 The Monkey Farm is a community effort to help Costa Rica’s howler monkeys and other animals in need. The Monkey Farm is still in its infancy and was established in December of 2013. Since starting the Monkey Farm, volunteers have rescued 21 howlers, but their rescue efforts don’t stop there. They have also rescued injured horses, goats, birds, raccoons and even an armadillo. Many of the animals that come to the Monkey Farm are young, orphaned animals that cannot survive on their own. Others are brought when they are injured and in need of medical care and a safe place to recover. While I was there, I met Ariel, a young howler that had been attacked by a dog and was completely paralyzed. After weeks of medications, bandage changes and supportive care he was back to normal. 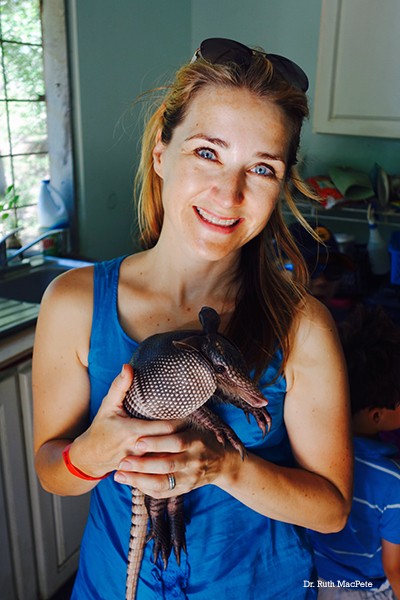 I also met Anabelle, a young 9-banded armadillo that was injured a week before my visit, when a horse kicked her. Anabelle suffered a spinal cord injury and was on medication, physical therapy (including swimming) and rest. I am happy to report that just a week later she is beginning to use her back legs again. She will continue to stay at Monkey Farm until she makes a full recovery and can be re-released into the wild. Anabelle and Ariel are just an example of some of the many animals The Monkey Farm’s dedicated team have helped. How can you help the monkey farm? The Monkey Farm depends entirely on donations and the help of volunteers from all over the world. Volunteers have come from the United Kingdom, France and of course, the US. Volunteers commit for at least a month and live on the farm, helping to care for the animals and improve the facilities. If you are planning a trip to Costa Rica, and wish to visit the Monkey Farm, it’s located in Playa Ocotal, Guanacaste province, near Playa del Coco. They offer tours of the Monkey Farm, horseback riding to the beach and welcome all volunteers.